When all is said and done, the vast majority of the two discs are absolutely killer. The first disc in particular is a rip ride through some of the greatest metal ever laid down. Two thirds of the second disc is awe inspiring too. If you fancy an introduction to the band or need a one stop shop to replace worn vinyl or lost CDs, this compilation is undoubtedly for you as it is superb. What a band! Kreator form one part of the big three/big four of German thrash metal. Along with Sodom, Destruction and Tankard their status as Teutonic metal legends is not in doubt. This two disc compilation catches their classic career period and also their tailing off in the early 90's. Naturally, a band this good would not stay down for long and their post millennium albums have also been by and largely good to excellent (“Phantom Antichrist” is fantastic). Kreator these days have more melodic tendencies and the chaos is more restrained. Melody and restraint are not words I would use in connection with the best of the material on offer here; “Endless Pain” is a more extreme version of Venom and the material from that nasty record played a part in the nascent death metal and even black metal genres. Similarly, “Pleasure To Kill” is revered as a thrash classic and often mentioned as the one album that could rival “Reign In Blood” for violence and intensity. There is no doubt that the material from those two albums sounds superb here; violent, chaotic and the aural equivalent of a riot (of violence). Tracks such as “Bonebreaker” veer close to Motorhead in approach, while “Under The Guillotine” is just brutal and devastatingly fast thrash, plain and simple. “Ripping Corpse”, probably my favourite from Kreator and indeed the “PTK” album sounds as vicious as it did when I first heard it. “Terrible Certainty” is represented well here with clear improvements in musicianship and even production; this is a more clinical version of Kreator, but no less devastating. There is even a little melodic intro to “Behind The Mirror” which is a tiny portent of things to come in a distant future for the band. The band upped their game again for “Extreme Aggression”- the material from that album is tight and focused and well played too; it is the sound of a band in total command of their style and the tracks selected to open up the second disc are excellent. “Love Us Or Hate Us” is still a thrash anthem and sounds great here as do the other choice cuts from the album. “Coma of Souls” from 1990 gets a good showing here too; the band still plays in the traditional thrash style and the album is a good- if not great- one. Certainly it would be greater than what followed. The guitars sound reliably gnarly and the overall production is really quite good. Ventor's twin kicks are high in the mix with an almost “And Justice For All” style slap to the sound- but the snare is a little echoey and distant (probably a reaction to the bizarre compressed snare of “And Justice For All”). “People of the Lie” is the “hit” from the “Coma...” album and is included here. That makes five cracking albums in a row from Kreator in a short time period, too. Thereafter, the issue of “Renewal” rears its head. It is no secret that thrash went through a fallow period in the post “Black Album” (and then grunge) landscape. Most bands changed; Testament released some simplified and slowed down records, even Overkill kind of aped Sabbath on the distinctly un-thrash “I Hear Black”. Kreator experimented with industrial sounds and slower tempos for “Renewal”. Honestly, the tracks from it here are not bad, per se, but just not why I would listen to Kreator (i.e. for brutal and violent thrash). Ultimately, the most and least you could say about “Renewal” is that it was a record of its time and place. It is bizarrely over-represented here and the samples and sound effects employed on tracks such as “Depression Unrest” sound out of kilter with the rest of this excellent compilation. When all is said and done, the vast majority of the two discs are absolutely killer. The first disc in particular is a rip ride through some of the greatest metal ever laid down. Two thirds of the second disc is awe inspiring too. 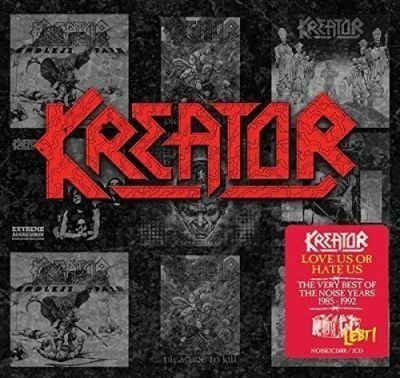 Kreator would claw their way back from the wilderness ten years later, but the band's exit from Noise Records and subsequent 90's releases are not their most celebrated moments. If you fancy an introduction to the band or need a one stop shop to replace worn vinyl or lost CDs, this compilation is undoubtedly for you as it is superb. What a band!